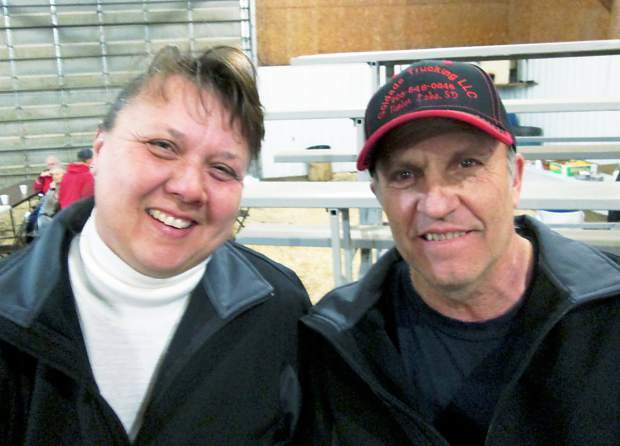 Deb and Lawrence Goldade, Timber Lake, South Dakota, bought three bulls. Gary Sandmeier, Cal Sandmeier, Chris Effling from Tri-State Livestock News, Colt Keffer from the Charolais Journal, and Matthew Sandmeier. Kent Aasby, Presho, South Dakota, with Bruce McCloud, Highmore, South Dakota. Sandmeier Charolais presented the most complete set of bulls that I've seen since I started working their sale. These were pounds the heaviest set of bulls that were packed full of muscle. 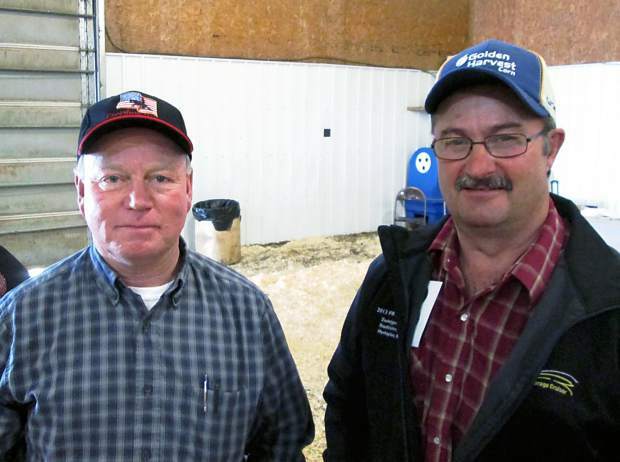 Calvin and Gary Sandmeier have bred these cattle for their commercial customers to use mostly on their English and English X cows. Now that Matthew has joined this operation, he has brought a renewed sense of enthusiasm for breeding better cattle with more performance. The bulls were all PredicGen tested for marbling, yield grade, tenderness, and indexed. This DNA information is offered as another tool to make a selection. However, the hybrid vigor Charolais offers is possibly the most economically important contribution a Charolais bull can give. Many repeat buyers were back on the seats this year to evaluate this good set of bulls. You can buy outstanding bulls in volume at Sandmeiers. Top selling bull of the day was Lot 5085, going for $13,000, and selling to Wienk Charolais from Lake Preston, South Dakota. This March yearling son of Ike All State 3159 had EPDs of BW 1.0, WW 51, and YW 90. Born at 95 pounds, he weaned at 859 pounds, and posted a yearling weight of 1,502 pounds. He had a 19.1 square inch rib eye and a 41.5 cm. scrotal measurement. Long time repeat buyer, Dennis Hulm, from Meadow, South Dakota, topped the fall division by buying Lot 4508 at $12,500. Here was a son of TR Mr. Wrangler Up 2516Z. With an 89 pound birth weight, he weaned at 883 pounds, and grew to a yearling weight of 1,486 pounds. Kent Aasby from Presho, South Dakota, chose Lot 4505, a fall calving ease bull, at $12,000. He was a son of SCR Sir Long Shot 2158P, and hit the ground at 84 pounds. He weaned at 901 pounds, and reached 1,531 pounds as a yearling. His rib eye was 17.9 square inches. After some aggressive bidding, Lot 4515 sold to repeat buyer, Mike Peterson, from Cresbard, South Dakota, for $11,500. This fall bull was by SCR Sir Long Shot 2158P, and had an 83 pound birth weight. He weaned at 923 pounds and posted a yearling weight of 1,480 pounds. 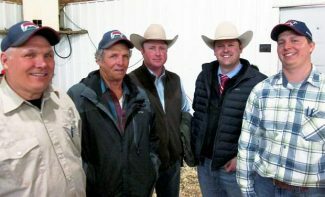 Lot 4512 was another fall bull purchase for Mike Peterson, and he sold for $11,500. He had an 84 pound birth weight, a weaning weight of 852 pounds, and a yearling weight of 1,535 pounds. He was sired by Keys Tenacious 10W, and had an 18.0 square inch ribeye. 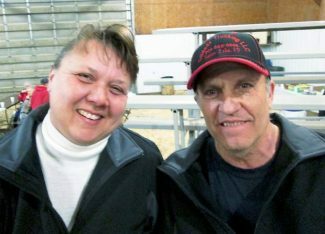 Repeat buyer Terry Henderson from Hettinger, North Dakota, picked Lot 5328, a yearling bull that had gained 5 pounds per day. He was a son of Wells Hard as a Rock, with an 88 pound birth weight, a weaning weight of 863 pounds, and a yearling weight of 1,516 pounds. He sold for $11,500. He had an 18.9 square inch ribeye. Lot 5021 sold to repeat buyer Eagle Nest Ranch from Lodgepole, South Dakota, for $11,500. Born at 89 pounds, he weaned at 857 pounds, and had gained 5.5 pounds per day to post a 1566 pound yearling weight. He had a 41 cm. scrotal measurement, and was sired by M6 Fresh Air 8165 P ET, a grandson of LT Wyoming Wind. The Sandmeiers are north of the small town of Bowdle, and about 55 miles west of Aberdeen, South Dakota.